The concept of “Ministry at Large” refers to ministering to people outside the immediate community of a particular church. First Church has a long tradition of Ministry at Large, going back to The Rev. Robert Collyer in 1859. Rev. 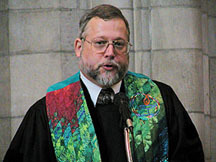 Dr. David Arksey is the third person to occupy this position, after The Rev. Robert Collyer and The Rev. George Sikes. His particular area of focus is pastoral care and counseling with families, couples and individuals in both short and long-term therapy. He is currently on the staff of Counseling Ministries, a group pastoral counseling practice with several offices in the Chicago area. In addition he is a former Adjunct Faculty member at Meadville/Lombard Theological School and formerly on the Supervising Faculty of The Family Institute. Rev. Arksey has a B.A. from Kalamazoo College, a Master of Arts in Theological Studies from Meadville/Lombard Theological School, and a Doctor of Ministry (D. Min.) 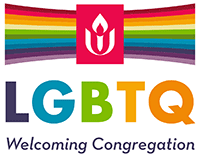 from Chicago Theological Seminary. He is a Clinical Member and Approved Supervisor of the American Association for Marriage and Family Therapy and a Fellow (Certified) of the American Association of Pastoral Counselors. Rev. Arksey was ordained and installed in 1977 and in the fall of 2007 he celebrated his 30th anniversary as Minister at Large at First Church. He is married to Brenda Chock Arksey, Director of Childrens Education and Developmental Services at the Chinese-American Service League.